The Battle of Waxhaws was also known as the Waxhaws or Waxhaw massacre, and Buford's massacre took near Lancaster, South Carolina, between a Continental Army force and a mainly Loyalist force. Colonel Buford refused an initial demand to surrender, but when his men were attacked by Lieutenant Colonel Banastre Tarleton's British cavalry, many threw down their arms to surrender. Buford apparently attempted to surrender. However, Tarleton was shot at during the truce, having his horse fall and trap him. Loyalists and British troops were outraged at the breaking of the truce in this manner and proceeded to fall on the Americans. While Tarleton was trapped under his dead horse, men continued killing the Continental soldiers, including men who were not resisting. Little quarter was given to the patriots/rebels. Of the 400 or so Continentals, 113 were killed with sabers, 150 so badly injured they could not be moved and 53 prisoners were taken by the British and Loyalists. "Tarleton's quarter", thereafter became a common expression for refusing to take prisoners. In some subsequent battles in the Carolinas, few of the defeated were taken alive by either side. 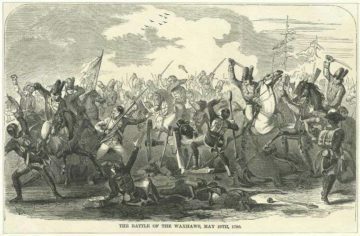 This 'Battle of Waxhaws' became the subject of an intensive propaganda campaign by the Continental Army to bolster recruitment and incite resentment against the British. Equally valid accounts of the battle by soldiers from both sides describe Tarleton as having no part in ordering a massacre as he had been trapped under his horse, and when freed immediately ordered thorough medical treatment of American prisoners and wounded. Armies - American Forces was commanded by Col. Abraham Buford and consisted of about 350 Soldiers. British Forces was commanded by Lt. Col. Banastre Tarleton and consisted of about 275 Soldiers. Casualties - American casualties were estimated to be 113 killed, 150 wounded, and 53 captured. British casualties were estimated to be 5 killed and 12 wounded. Colonel Abraham Buford led a force of between 350 and 380 Virginian Continentals—the 3rd Virginia Detachment (composed of the 7th Virginia Regiment, two companies of the 2nd Virginia Regiment and an artillery detachment with two 6-pounders)—to assist the Patriot forces in the Siege of Charleston. Before arriving, they learned that the city had already been captured by the British, and they turned back to Virginia. However, Tarleton heard that South Carolina's Patriot Governor John Rutledge was traveling with Buford. Anxious to capture Rutledge, Tarleton pursued with a force of roughly 230 men, consisting of 130 Legion dragoons, 100 Mounted British Legion infantry, and a 3-lb. cannon. In the event, only an advance force of 60 dragoons from the 17th Light Dragoons and the British Legion cavalry, 60 mounted infantry from the British Legion, and an additional flanking force of 30 British Legion dragoons and some infantry actually engaged in the main attack. On May 18, Lieutenant General Charles Cornwallis and 2,500 British troops marched out of Charleston with orders from Clinton to subdue the backcountry and establish outposts. He made his way to Lenud's Ferry, crossed the Santee River, and made his way towards Camden. 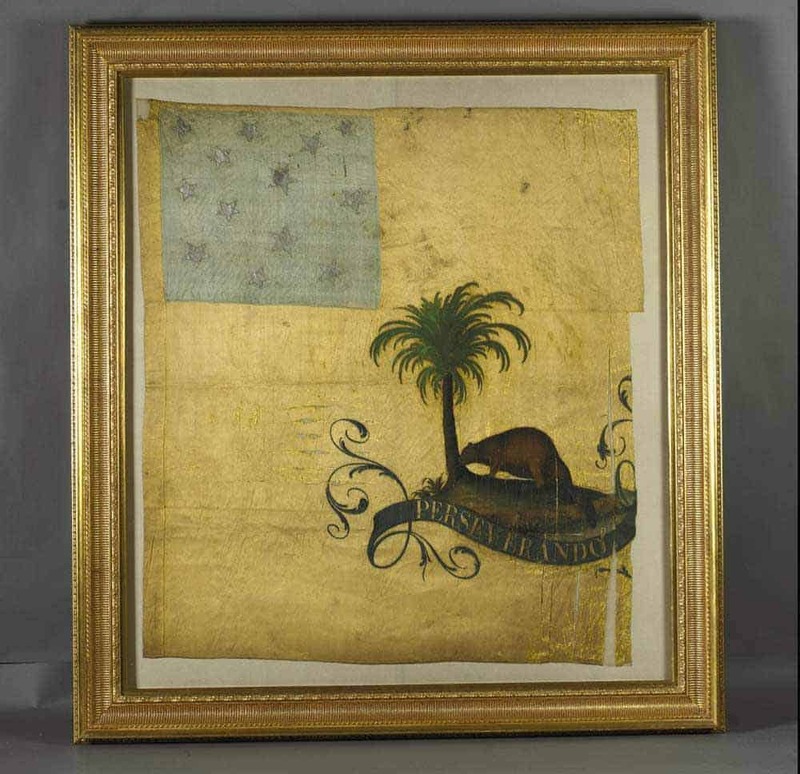 Along the way, Loyalists informed Cornwallis that South Carolina Governor John Rutledge was escaping into North Carolina and was being escorted by 350 Patriots, commanded by Col. Abraham Buford. Rutledge had managed to flee Charleston during the early stages of the city's siege. Brig. Gen. Issac Huger ordered Buford to gather up the Patriot survivors from the Battle of Monck's Corner, and retreat northward to Hillsboro, North Carolina. Buford'e force were at least 10 day ahead of Cornwallis. After a short pursuit, Cornwallis realized that the infantry was too slow to catch up with Buford's force. Therefore, Cornwallis assigned the mission to Lt. Col. Banastre Tarleton. On May 27, Tarleton left the main British column with 270 dragoons, Tory cavalry, and mounted infantry. They set out from Nelson's Ferry. His command force included 40 British Regulars of the 17th Dragoons, 130 of his British Legion cavalry , 100 mounted British Legion infantry, and one 3-lb. artillery piece. Since Buford had such a large lead on them, Cornwallis had given Tarleton discretion to continue the pursuit, turn back, or attack Buford if he caught up with him. Tarleton was at Camden the next day. Riding night and day, Tarleton's men caught up with the Patriots by covering more than 100 miles in 54 hours. Buford did not move rapidly enough as his commanders would have liked him too. Buford learned of Tarleton's approach and sent Rutledge, with a small detachment, to continue to Hillsboro while the remainder of the Patriots would stop and engage the British. On May 29, at Rugeley's Mill, Tarleton learned that Buford's force was now only 20 miles ahead. Tarleton sent a messenger ahead requesting that Buford surrender. In the message, Tarleton exaggerated his forces in hopes of scaring Buford into surrendering, or at least delaying him. After delaying the messenger, while his infantry reached a favorable position, Buford declined by replying: "Sir, I reject your proposals, and shall defend myself to the last extremity." At 3:00 P.M., Tarleton caught up with Buford near the Waxhaws District on the border of North Carolina and South Carolina. Waxhaws is 185 miles north of Charleston and 6 miles south of the North Carolina border. Tarleton's advance guard slashed through Buford's rear guard. Buford aligned his infantry and cavalry into a single line of defense with a small reserve posted in the rear. Tarleton divided his command into three detachments. On the right flank was 60 dragoons and 50 light infantry. On the left flank was Tarleton himself with another 30 dragoons and additional infantry. In the center were the rest of the 17th Dragoons and infantry. Tarleton's disposition was flexible enough to attack the center and both flanks of the Patriot force simultaneously. Tarleton formed up his troops on a low hill opposite the Patriot line. At 300 yards, his cavalry began their charge. When Tarleton's cavalry was 50 yards from Buford's line, the Patriots presented their muskets, but they were ordered to hold their fire until the British were closer. Finally, with the British only 10 yards away, Buford's men opened fire. Tarleton's horse was killed under him, but the forward momentum of the British charge was able to carry them into the Patriot lines. Patriot line was broken and in some cases, ridden down. The rout quickly began. Tarleton claimed that his horse was shot out from under him and he was pinned. His men, thinking that their commander had been shot and killed under a flag of truce, angrily attacked again. They slashed at anyone and everyone, including men who were kneeling with their hands up in surrender. The Patriots claimed that Tarleton himself ordered the renewed attack because he didn't want to bother with taking prisoners. Based on his aggressive style and zeal for brutal charges in other engagements, the Patriot claims are usually given more credence. The first complete statement claiming that a massacre occured did not appear until 1821 in a letter from Dr. Robert Brownfield to William Dobein James. The battle lasted for about 15 minutes with Buford managing to escape. It took only days for Tarleton to be branded with the reputation. He became known as "Bloody Ban", "Ban the Butcher", or "Ban the Butcher." For the remainder of the war in the South, "Tarleton's Quarter" meant to show no mercy. 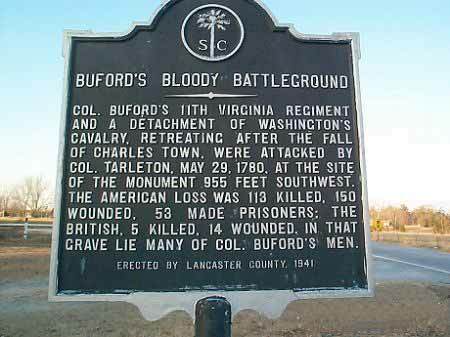 "Buford's Massacre" became a rallying cry for the Patriots. 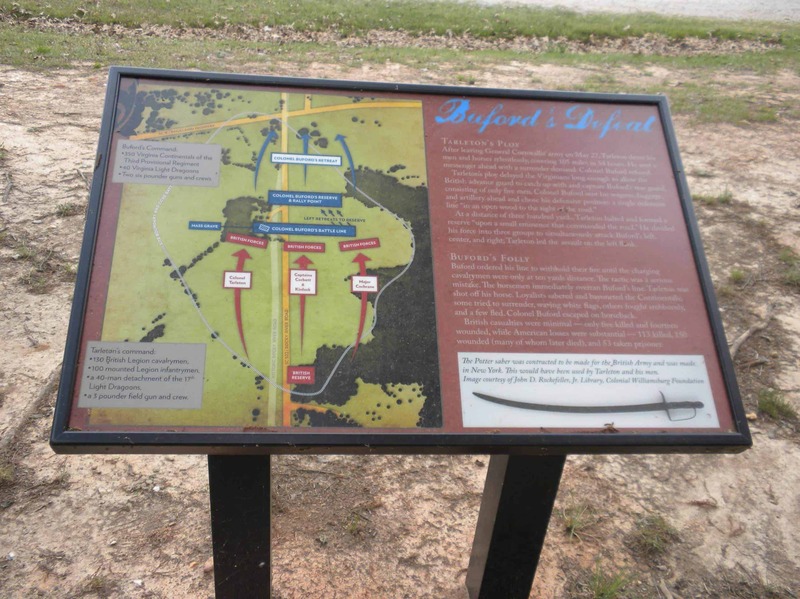 The battle has always been controversial, since after breaking Buford's line Tarleton's men slaughtered many of the Virginians who surrendered, hacking them down with their sabres. Some sources, such as Buford's Adjutant Henry Bowyer and Surgeon's Mate Robert Brownfield, claim that Buford belatedly raised a white flag but was ignored by Tarleton. In Tarleton's own account, he virtually admits the massacre, stating that his horse had been shot from under him during the initial charge and his men, thinking him dead, engaged in "a vindictive asperity not easily restrained." After the battle, the wounded were treated at nearby churches by the congregants, one of whom was a young Andrew Jackson. Tarleton claimed that after the battle ended, the wounded of both sides were treated "with equal humanity" and that the British provided "every possible convenience". Due to the large number of wounded, people from all over the countryside came to assist in their care. When they learned of what had happened, albeit one-sidedly, news of the apparent "violation" of "quarter" on Tarleton's part spread rapidly through the region. The battle, at least temporarily, consolidated British control over South Carolina, and Patriot sentiment was at a low ebb. 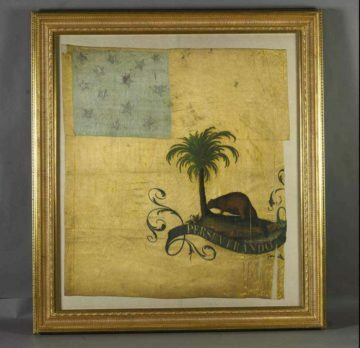 General Clinton, among other acts before he left Charleston for New York, revoked the parole of surrendered Patriots. This affront (violating accepted "rules of war"), and reports of this battle, may have changed the direction of the war in the South. Many who might have stayed neutral flocked to the Patriots, and "Tarleton's Quarter!" and "Remember Buford" became rallying cries for the Whigs. News of the "massacre" directly inspired the creation of volunteer militia forces among the "over-mountain men" (from the Wataugan settlements at and near Sycamore Shoals). These militia participated in actions against British Loyalists at both the Battle of Musgrove Mill on August 18 (near present-day Clinton, South Carolina) and in the decisive defeat of British Major Patrick Ferguson's command on October 7, 1780 at Kings Mountain (near present-day Blacksburg, South Carolina).